The Mercury spacecraft is described in some detail in references 1 and 2. The MR-4 flight was the fourth mission in the Mercury-Redstone series of flight tests, all of which utilized the Mercury spacecraft. Each spacecraft differed in small details, and the differences between the MR-3 and MR-4 spacecraft are discussed herein. As shown in figure 2-1, the main configuration differences were the addition to the MR-4 spacecraft of a large viewing window and an explosively actuated side hatch. Figure 2-1. 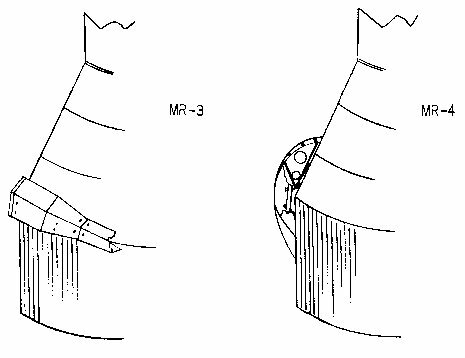 Configuration differences between MR-3 and MR-4 Spacecraft. The addition of the large viewing window in the position shown in the figure was a result of a change requested by the Mercury astronauts. This window enables the astronaut to have a greater viewing area than the original side port windows. The field of view of the window is 30o in the horizontal plane and 33o in the vertical. The window is composed of an outer panel of 0.35-inch-thick Vycor glass and a layer 3-layer inner panel. The top layer of this inner panel is 0.17-inch-thick tempered glass. The Vycor glass panels will withstand temperatures in the range of 1,500o and 1,800o F. The inner layers of tempered glass will withstand the cabin-pressure differences. Magnesium fluoride coatings were applied to reduce glare. Although not installed for the MR-4 flight, a removable polaroid filter to reduce glare further and a red filter for night adaptation are available for the window. The explosively actuated side hatch was used for the first time on the MR-4 flight. The mechanically operated side hatch on the MR-3 spacecraft was in the same location and of the same size, but was considerably heavier (69 pounds as installed rather than 23 pounds). The explosively actuated hatch utilizes an axplosive charge to fracture the attaching bolts and thus separate the hatch from the spacecraft. Seventy 1/4-inch titanium bolts secure the hatch to the doorsill. A 0.06-inch-diameter hole is drilled in each bolt to provide a weak point. A mild detonating fuse (MDF) is installed in a channel between an inner and outer seal around the periphery of the hatch. When the MDF is ignited, the resulting gas pressure between the inner and outer seal causes the bolts to fail in tension. The MDF is ignited by a manually operated igniter that requires an actuation force of around 5 pounds, after removal of a safety pin. The igniter can be operated externally by an attached lanyard, in which case a force of at least 40 pounds is required in order to shear the safety pin. 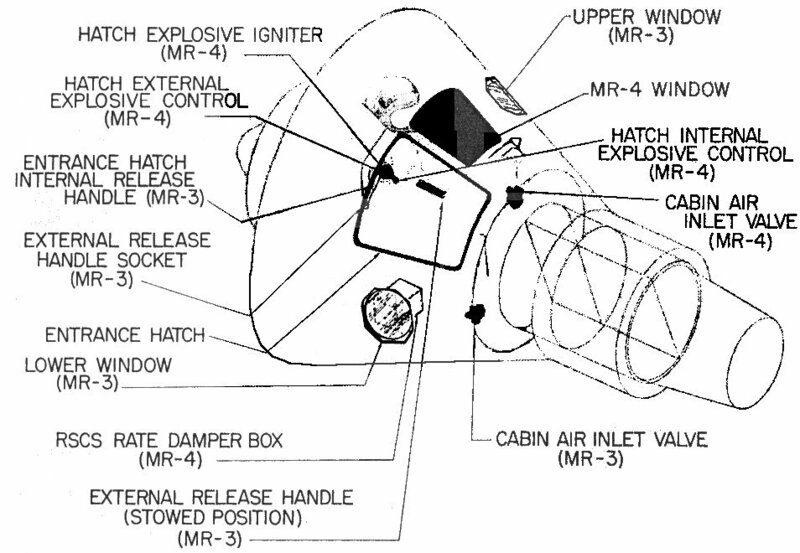 Other differences between the MR-3 spacecraft and the MR-4 spacecraft, not visible in figure 2-1, include: (a) redesigned clamp-ring covers, (b) changed instrument panel, and (c) the incorporation of a rate command control system. The fairings around the explosive bolts were changed to a more streamlined shape from the original rectangular shape to reduce buffeting. Also, the upper part of the fairings were hinged so that at separation they would flip off rather than slide down. There was evidence that on a previous Little Joe-Mercury flight, the umbilical connections had been damaged by this sliding action. Figure 2-2 shows the differences between the MR-3 and MR-4 covers. Figure 2-2. Clamp-ring covers for MR-3 and MR-4 spacecraft. 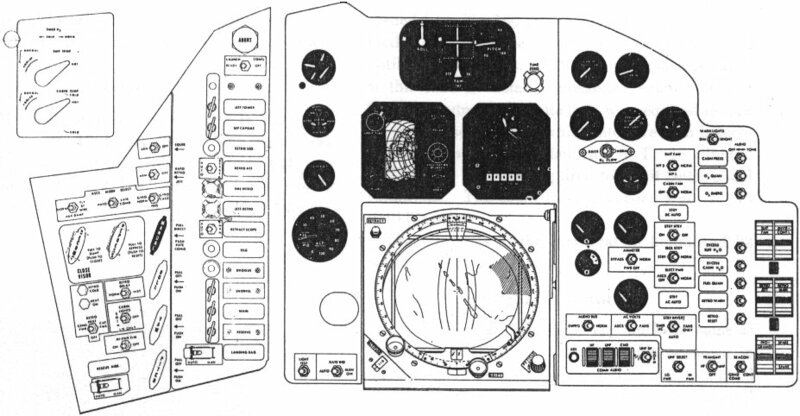 A comparison between the MR-4 spacecraft instrument panel, shown in figure 2-3, and the MR-3 panel, presented in reference 1, reveals that the differences were mainly the rearrangement of controls and indicators and the addition of an earth-path indicator. The earth-path indicator was inoperative for the MR-4 flight, however. Figure 2-3. 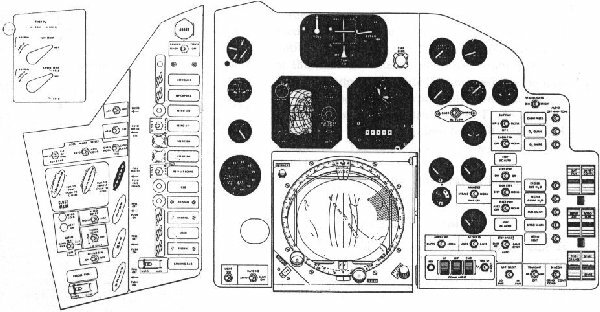 Main instrument panel and consoles for MR-4 spacecraft. The major difference between the stabilization and control systems of the MR-3 and MR-4 spacecraft was the addition to the MR-4 spacecraft of a rate command control system which operated in connection with the manual reaction control system (RSCS) senses and commands spacecraft rates rather than attitudes. The system damps to the commanded rate to within +/- 3 deg/sec. Without manual command, it damps to zero rate within +/- 3 deg/sec. The prelaunch preparation period was essentially the same as for the MR-3 mission. A brief description of the activity during this period follows. Prior to launch of the MR-4 spacecraft, the assigned pilot for the mission started an intense training routine at Cape Canaveral, Fla., and at the NASA Manned Spacecraft Center, Langley Air Force Base, Va., to familiarize hinself with the various details of the spacecraft systems and to sharpen his reactions to various situations. During this period, the pilot participated in a centrifuge training program in which 17 Mercury acceleration profiles were run. The pilot took part in environmental control system tests, communications tests, reaction control system tests; obtained 100 simulated missions on the procedures trainer; conducted 36 simulated missions on the air-lubricated free-attitude (ALFA) trainer; and practiced insertion exercises and RF tests in which the pilot and spacecraft were exercised in a simulated count through lift off. On July 21, 1961, after two delays in the launch date, the pilot was prepared and inserted in the spacecraft at 3:58 a.m. e.s.t. Launch occured at 7:20 a.m. e.s.t. The spacecraft was delivered to Hangar "S" at Cape Canaveral, Fla., on March 7, 1961. Upon delivery, the instrumentation and selected items of the communication system were removed from the spacecraft for bench testing. After reinstallation of the components, the systems tests proceeded as scheduled with only slight interruptions for work periods. Those tests required a total of 33 days, during which the electrical, sequential, instrumentation, communication, environmental, reaction-control, and stabilization and control systems were individually tested. After systems tests, a short work period was required to install the landing-impact bag. A simulated flight was then run on the spacecraft which was followed by installation of parachutes and pyrotechnics, weighted and balanced, and delivered to the launch complex for mating with the booster. Twenty-one days were spent on the launching pad during which the spacecraft and booster systems were checked both separately and as a unit. After the systems checks were completed, a spacecraftlaunch-vehicle simulated flight was performed. The spacecraftlaunch-vehicle combination was then ready for launch. A period of136 days elapsed between delivery of the spacecraft to Cape Canaveral, Fla., and its successful launch. The MR-4 launch occured on July 21, 1961, 47 days after the first manned ballistic flight by Astronaut Alan B. Shepard, Jr. The launch-vehicle system checks and preparations proceeded as scheduled with only minor malfunctions which caused no delays in the schedule. During the split countdown on the launching pad, the launch-vehicle countdown proceeded smoothly with no hold periods chargeable to the launch-vehicle systems. The MR-4 spacecraft was launched at 7:20 a.m. e.s.t. on July 21, 1961 (fig. 2-4). The launch was originally scheduled for July 18, 1961, but was rescheduled to July 19, 1961, because of unfavorable weather conditions. 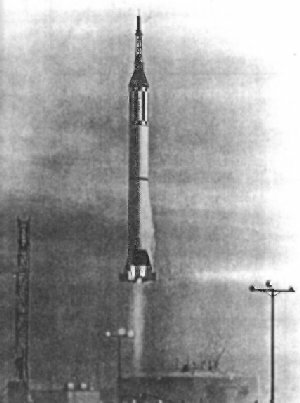 The launch attempt of July 19, 1961, was canceled at T-10 minutes as a result of continued unfavorable weather. The launch was then rescheduled for July 21, 1961. The first half of the split countdown was begun at 6:00 a.m. e.s.t. on July 21, 1961, at T-640 minutes. Spacecraft preparation proceeded normally through the 12-hour planned hold period for hydrogen peroxide and pyrotechnic servicing. Evaluation of the weather at this time affirmed favorable launch conditions. The second half of the countdown was therefore begun at 2:30 a.m. e.s.t. on July 20, 1961. At T-180 minutes, prior to adding liquid oxygen to the launch vehicle, a planned 1-hour hold was called for another weather evaluation. The weather evaluation was favorable and the countdown proceeded from T-180 minutes at 3:00 a.m. e.s.t. No further delays in the countdown were encountered until T-45 minutes. A 30-minute hold was called at this time to install a misalined hatch bolt. At T-30 minutes, a 9-minute hold was required to turn off the pad searchlights which interfere with launch-vehicle telemetry during launch. At T-15 minutes, a 41-minute hold was required to await better cloud conditions. The count then proceeded from T-15 until lift-off. The pilot was in the spacecraft 3 hours and 22 minutes prior to launch. Figure 2-4. Launch of the Mercury-Redstone 4 from Cape Canaveral launch site on July 21, 1961. The MR-4 flight plan was very much the same as that for the MR-3. The flight profile is shown in figure 2-5. As shown, the range was 262.5 nautical miles, the maximum altitude was 102.8 nautical miles, and the period of weightlessness lasted for approximately 5 minutes. Figure 2-5. Flight profile for MR-4. At T-35 seconds, the spacecraft umbilical tower was pulled and the periscope was retracted. During the boosted phase of flight, the flight-path angle was controlled by the launch-vehicle control system. Launch-vehicle cutoff occurred at T+2 minutes 23 seconds, at which time the escape tower clamp ring was released, and escape tower was released by firing the escape and tower jettison rockets. Ten seconds later, the spacecraft-to-launch-vehicle adapter clamp ring was separated, and the posigrade rockets fired to separate the spacecraft from the launch vehicle. The pericope was extended; the automatic stabilization and control system provided 5 seconds of rate damping, followed by spacecraft turnaround. It then oriented the spacecraft to orbit attitude of -34o. 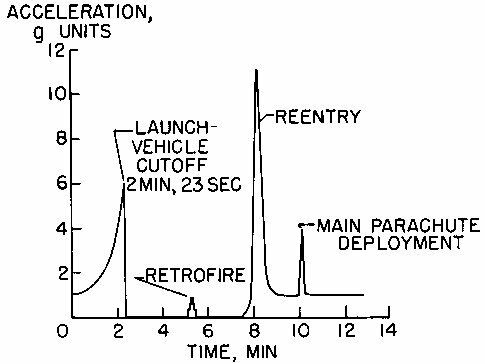 Retrosequence was initiated by timer at T+4 minutes 46 seconds, which was 30 seconds prior to the spacecraft reaching its apogee. The astronaut assumed control of spacecraft attitude at T+3 minutes 5 seconds and controlled the spacecraft by the manual proportional control system to T+5 minutes 43 seconds. He initiated firing of the retrorockets at T+5 minutes 10 seconds. From T+5 minutes 43 seconds, he controlled the spacecraft by the manual rate command system through reentry. The retrorocket package was jettisoned at T+6 minutes 7 seconds. The drogue parachute was deployed at T+9 minutes 41 seconds, and main parachute, at T+10 minutes 14 seconds. Landing aoccured at T+15 minutes 37 seconds. A comparison of the flight parameters of MR-4 and MR-3 spacecraft, listed in table 2-I, shows that both flights provided similar conditions. The acceleration time history occurring during the MR-4 flight is shown in figure 2-6 and is very similar to that of the MR-3 flight (ref. 1). Figure 2-6. Acceleration time history for MR-4 flight. The recovery-force deployment and spacecraft landing point are shown in figure 2-7. The spacecraft was lost during the postlanding recovery period as a result of premature actuation of the explosively actuated side egress hatch. The astronaut egressed from the spacecraft immediately after hatch actuation and was retrieved after being in the water for about 3 to 4 minutes. Figure 2-7. Chart of recovery operations. The spacecraft and its systems performed well on the MR-4 flight; the major difficulty was the as yet unexplained premature separation of the side egress hatch. A minor control problem was noted in that design turning rates were not achieved with full stick deflection. This problem is believed to be due to control linkage rigging. Anon. : Proceedings of Conference on Results of the First U.S. Manned Suborbital Space Flight. NASA, Nat. Inst. Health, and Nat. Acad. Sci., June 6, 1961. Hamack, Jerome B., and Heberlig, Jack C.: The Mercury-Redstone Program. [Preprint] 2238-61, American Rocket Soc., Oct. 1961.